The Passage is the very first poem published in the wonderful And I Alone Escaped to Tell You, a collection of poetry by filmmaker and writer Sylvia Hamilton. (Gaspereau Press, 2014). I can’t think of a better way to ring in African Heritage Month here in Nova Scotia. Hamilton’s poems about slavery, racism and rebellion are so precisely placed in Nova Scotia landscapes that for me this place will never look the same again. Listen to this CBC interview of Sylvia Hamilton by Shelagh Rogers. You’ll find both interviewer and interviewee much more articulate than I am. The Severn was a Baltimore built slave ship that was sold at auction in Halifax in 1811, renamed The Liverpool Packet and used as a privateer during the War of 1812. A replica of the Packet is on view at the Queen’s County Museum in Liverpool, Nova Scotia. 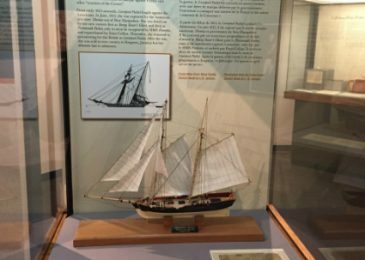 The photograph depicted here is of a model of the Liverpool Packet that was on display in 2014 at the Maritime Museum of the Atlantic during the War of 1812 Prize-Prejudice Exhibit. My installation, Excavation: A Site of Memory, was mounted in conjunction with that exhibit.